In this video, we are going to look at tangent and secant lines. Tangent Line: Line that intersects the circle, but only at one spot. 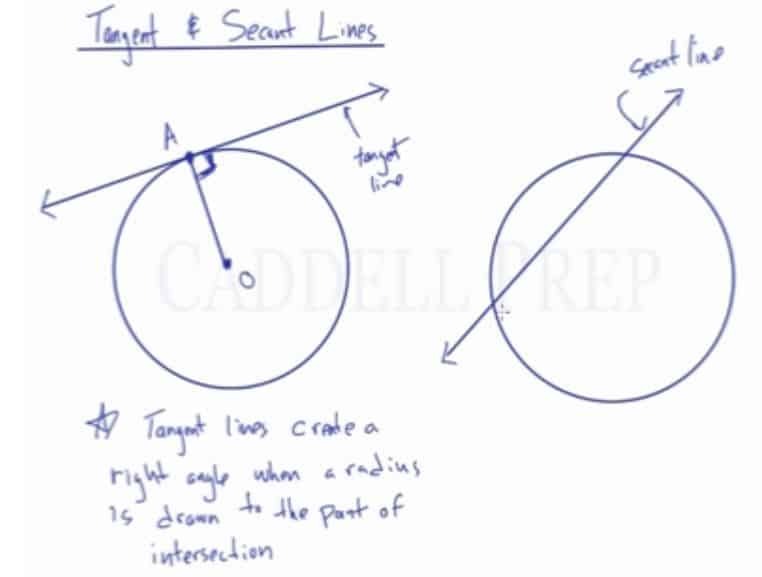 Secant Line: Line that intersects the circle, but in two spots and continues through the circle. If the center of the circle is the point , and the point where the tangent touches the circle is the point , then is the radius. The angle that the radius forms with the tangent line is always a right angle. In this lesson, we’ll take a look at tangent and secant lines. A tangent line is a line that intersects with a circle in only one spot. This line drawn intersects with a circle at only one point. So, this is a tangent line. A secant, on the other hand, intersects in two spots. This is an example of a secant line. Remember, a chord also intersects in two spots. But a secant continues through. The part of a secant inside the circle is a chord. But the entire line is a secant. It extends on both sides and out of the circle. Something important about the tangent line has to do with the radius. If we have a point in the middle of the circle called and the point where the tangent line intersects with the circle is called . Then, will be the radius. The angle that this radius makes with the tangent line is always a angle. Tangent lines create a right angle when a radius is drawn to the point of intersection. Tangent line intersects in one spot while secant intersects in two spots.